Ruffwear produce some of the best quality dog accessories we have ever seen and their Front Range Harness is no exception. Supurb materials and attention to detail. The Front Range dog harness features a comfortable ergonomic fit which distributes pressure evenly. Four way adjustment ensures a perfect fit whatever your breed of dog. Two lead attachment points and reinforced webbing on the chest area ensures security. ID pocket and reflective trim for low light visibility. 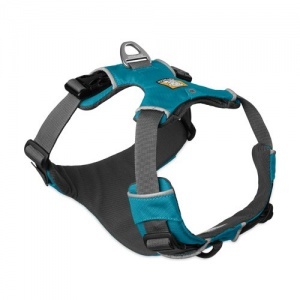 This is a comfortable easy to use dog harness that is perfect for everyday use.